So many variety of unique Sundanese culinary flavor in Bandung which you can get. One of them is PEUYEUM (sweet-fermented-cassava). Wow …. how do I say it in English?! Hmmmm …..It’s quite hard to pronounce it for non-Sundanese tongue. But it isn’t hard to taste the unique-sweet flavor of this traditional cuisine, that has became an iconic delicacy in Bandung. 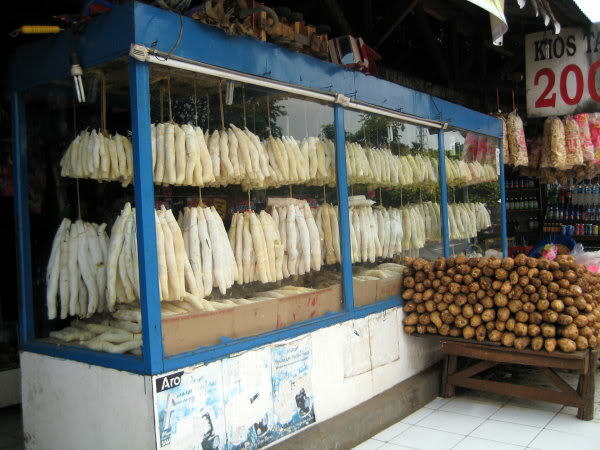 Bandung is famous for a variety of foods. From the traditional to modern. 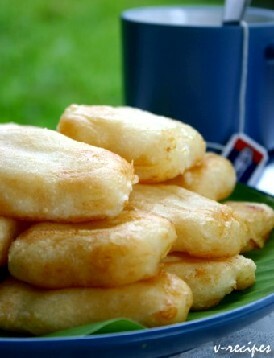 However, peuyeum remains among the specialties which remain to be an excellent and unique Bandung’s culinary. Actually, there are 2 kinds of peuyeum : cassava-peuyeum and glutionous-rice peuyeum (peuyeum ketan, ind). But, in this article I’m gonna share with you, the recipe of making cassava-peuyeum first (later, might be glutinous-rice peuyeum). How to make? – Cassava is peeled, washed and cut according to taste. – Yeast, which had been crushed until soft. – Cassava boiled 2 times / 2 phases. First phase, boiled 1.5 hours, remove and drain. The second phase, boil 1 hour, remove and drain. Then, save it in the open and shady place, which has been covered with banana leaves. Let stand for a moment. – Smear the cassava to yeast. Let stand for a moment. – Lift and store the cassava into the container / bamboo basket (which has been covered with banana leaves) until it is full and dense. Cover them with banana leaves. – Then close the basket with cloth tightly. Store in a cool place, 1-3 days. – Peuyeum ready to served. 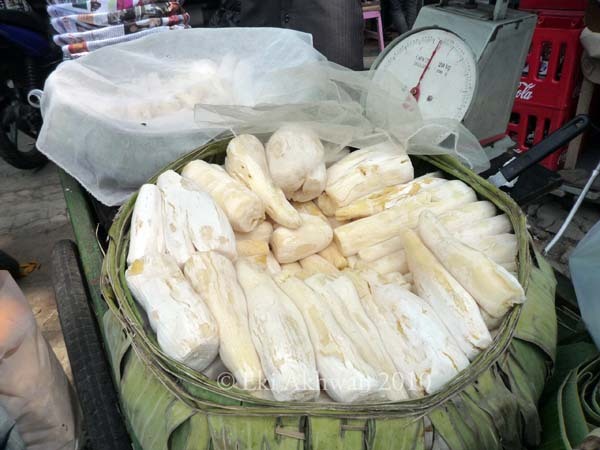 Actually, there are two techniques to make cassava-peuyeum, 1) Wet technique: where peuyeum somewhat soft and sweet, 2) dry technique: peuyeum dry and tasty, and usually, traders sell it by hang it in their stalls, without experiencing damage. Therefore, known as “hanging-peuyeum” (peuyeum gantung, ind). Hanging-peuyeum popular in Purwakarta and Subang (North Priangan). This entry was posted on Sunday, January 30th, 2011 at 1:54 pm	and tagged with Bandung, cassava, peuyeum, resep and posted in Foods & Beverages, Souvenirs. You can follow any responses to this entry through the RSS 2.0 feed. Hello! ececcdd interesting ececcdd site! I am so thankful I found your blog! Fermented cassava thrills me. What kind of yeast is suitable to use here? Is that a powder yeast? Should each cassava slice be coated thoroughly with this yeast? Please post the 2 techniques very soon. Hi there. Thank you for your visiting my blog. One of the ingredients to make peuyeum Bandung is yeast. As far as I know the yeast sell in local markets in solid form. But when it used to make peuyeum, crushed it then spread evenly on cassava.